On July 23, 2008, New York Governor David Paterson signed a bill authorizing his Department of Environmental Conservation to adjust regulations to accommodate shale gas wells in New York. The bill was drafted by the DEC. But it was designed around the needs of industry to speed the processing of permits. Because the subterranean footprint for a shale gas well, which runs horizontally, is much larger than a conventional, vertically-drilled well, larger spacing units were necessary to determine the distribution of royalties along the property boundaries above. The “spacing bill,” as it was known, was essentially a mapping function and did not regulate the mechanics of drilling. But without it, each permit would require a variance – a process that would require public hearings for each well, opening the door for a new set of problems for the industry. Back in the summer of 2008, conventional wisdom held that shale gas would proceed in New York sooner or later, and the spacing bill was clear evidence that the state was ready to pave the way. But Paterson’s signature came with a catch. Responding to an upwelling of opposition from grass roots environmental and community groups, Paterson directed the DEC to determine whether other aspects of the state’s regulatory framework were suitable to protect the environment and communities in an impending era of unconventional drilling. Until the review was complete, permits would be put on hold. The statement found “potential significant adverse environmental and public health impacts associated with high-volume hydraulic fracturing operations.” State oversight could not provide sufficient safeguards against the risks “under any scenario” including “an extensive suite of mitigation measures.” In justifying a ban, the report also cites “limited economic and social benefits” of fracking. In short: too much risk, too little gain. The findings statement serves as denouement to a long string of events with which most people who feel passionately about the issue are undoubtedly familiar, but are easy to loose sight of over the course of a seven-year environmental epic. As it happens, the release of a findings statement coincides with an updated edition of Under the Surface. My book, released today in paperback with a new chapter, provides the backstory to this latest development. After a journey from the printers to Cornell University Press’s warehouse, readers can now find it in bookstores and online in digital and print format. One of the more difficult aspects of writing a non-fiction narrative is anticipating events that may affect the outcome of the story. The fracking story, of course, is full of stories within stories that are compelling and dramatic. I found plenty of them – from all sides of the issue -- to carry the narrative in the original edition, released at the height of fracking frenzy in the summer of 2012. As readers know, the narrative takes readers back and forth across the border of New York and Pennsylvania, following a cast of characters in each state both influencing and caught up in very different story lines. In Pennsylvania, the shale gas boom was allowed to proceed with gusto. In New York, Paterson’s policy review put it on hold, and led to events that made the state’s pending policy decision the centerpiece of one of the biggest environmental movements since Love Canal. The first edition of Under the Surface ends in Pennsylvania with residents of Carter Road locked in a lawsuit against Cabot Oil and Gas over polluted water wells. The Environmental Protection Agency is about to intervene with its own investigation of the problem – setting up a conflict involving the federal government, the state, the industry, and local residents. In New York, meantime, the anti-fracking movement -- drawing from events unfolding in Pennsylvania -- is reaching a critical mass of grass roots and institutional activism, while a gas company that already paid farmers in Deposit millions of dollars to lease their land seeks legal means to extend the leases and wait out the moratorium. I tell both of these stories a in new chapter called Turf Wars, and a new epilogue called The Final Say. 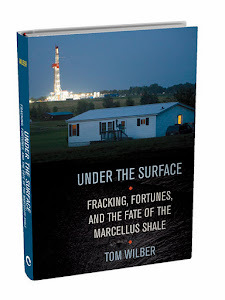 The Home Rule movement – which eventually established a community’s right to determine land use over New York State’s authority to permit shale gas development -- is central to the outcome in New York and a fascinating story in itself. It unfolded in the small towns of Dryden and Middlefield and other upstate localities, and led to a landmark decision by the state’s high court that gave Governor Andrew Cuomo important legal and political leverage for the eventual fracking ban. In Pennsylvania, the story is less about David v. Goliath than Goliath v. the Federal Government. The intervention of the EPA in the case of Dimock water pollution ends with a very different but no less influential outcome. Is it possible that residents of small towns appealing to their town-board have more influence in directing the course of the shale gas juggernaut than the federal government? It’s a question that communities sitting over shale reserves throughout the country are asking, or should be asking. There is much more to be said about this, and the people and personalities involved in directing the outcomes in Under the Surface are as interesting as the outcomes themselves. Now that you're done - would you please get back to blogging. Your public awaits. It's a madhouse out here in the hinterlands with the oil and gas exploitation thing going on and getting even crazier. Congrats on the updated edition. Great info on fracking in New York. Here in Tennessee it's alive and well and doesn't look to stop anytime soon. This is the homepage that increases the purchasing power. 바둑이추천 We look forward to your visit to our homepage. Thank you.